Father's Day coincided with M's birthday this year and sadly for Dave, M's birthday celebrations took precedent. Not that we forgot him and M did work hard to make suitable gifts for her Daddy, but we held them back for a week as M was rather focused on her own special day, after all it's not every day you turn three! 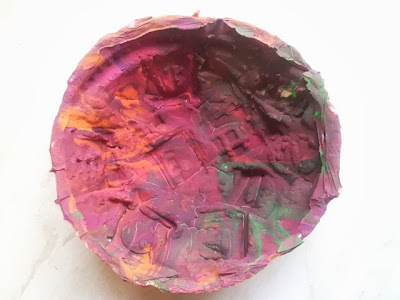 A key or coin bowl, made by M (June 2013). Daddy's foot, made by M (June 2013). 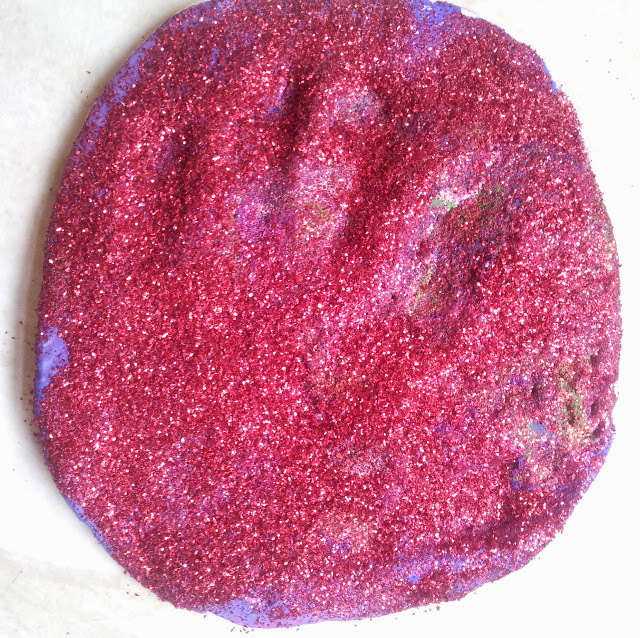 M's handprint, with a LOT of glitter (June 2013). And a chicken... Along with Mummy's Snail. 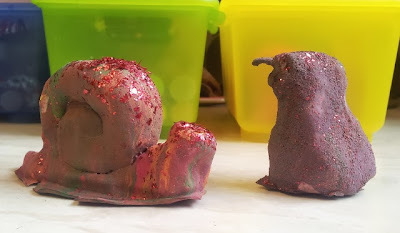 Mummy's snail and M's chicken on the right (June 2013). 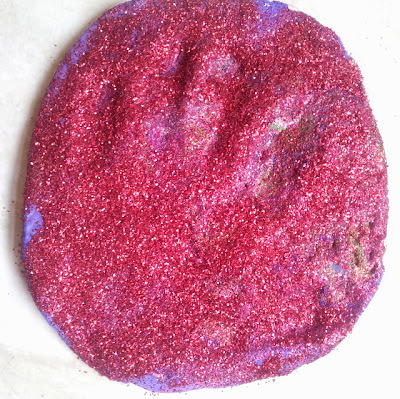 M worked hard on these, making the clay, moulding, sculpting, stamping, painting and glittering the result. All with a little help and guidance from Mummy of course. 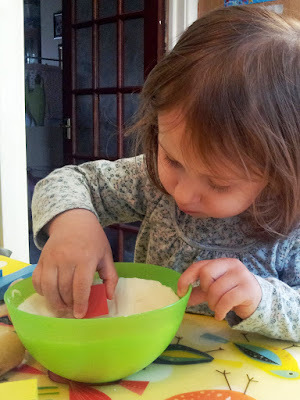 Firstly we made the clay, which is based on cornflour and bicarbonate of soda (or corn starch and baking soda). I could have made salt dough, but for some reason every time I try, the dough never turns our right. It always seems to be gritty and unpleasant to handle, so I don't think I've hit on the correct recipe yet. Either that, or it is supposed to be that way. 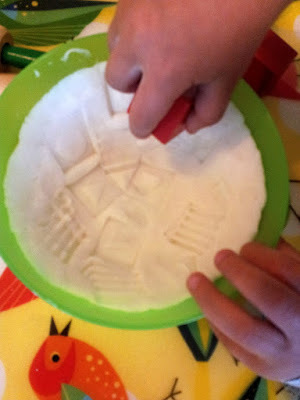 The cornflour clay however produces a smooth, pliant clay which feels a lot like commercial playdough to handle. 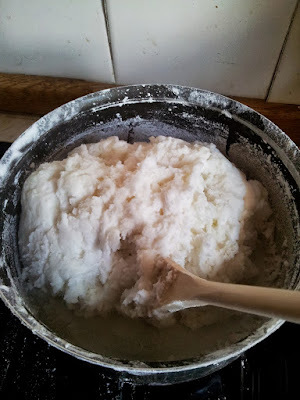 It doesn't dry the skin, is pleasant to work and can (in theory at least) be left to air dry or dried in an oven. 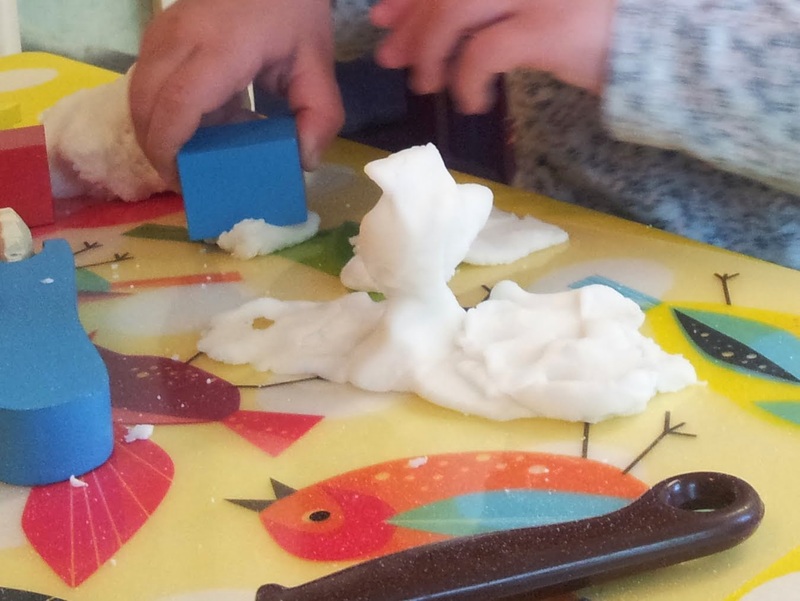 We last used this recipe to make Christmas decorations, so I hoped it would work out for M's first attempt at sculpting. 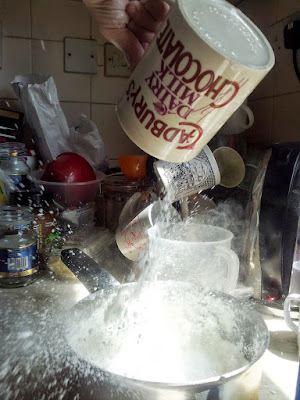 I measured out the ingredients and M put them in a saucepan. 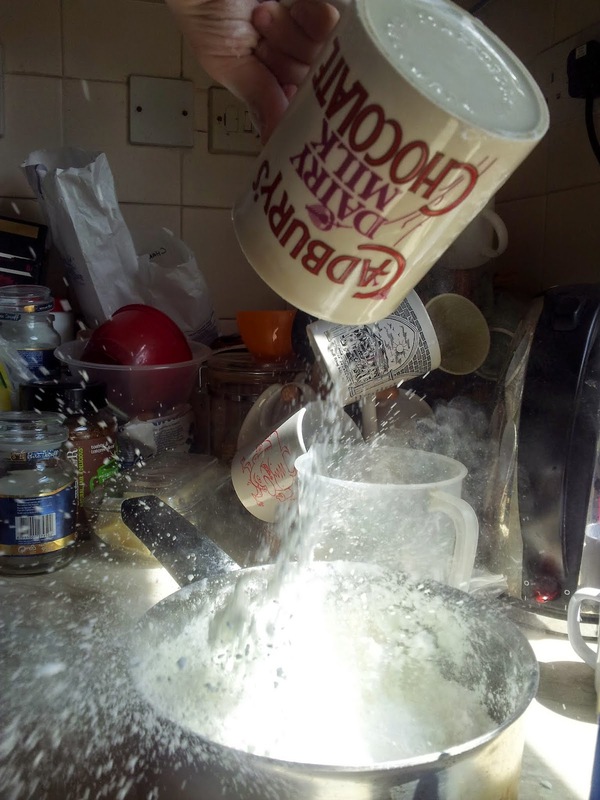 Ideally, you'd gradually add the water but M was a bit over enthusiastic so it all went in at once. 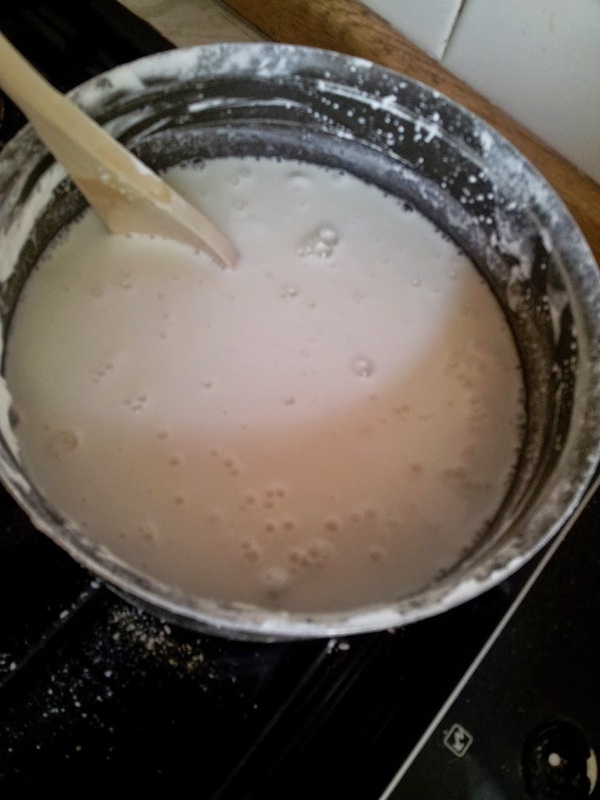 Cornflour, bicarb and water being cooked. 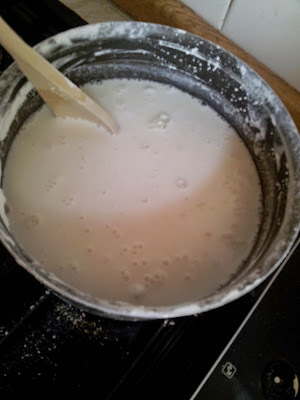 Once the ingredients were in the pan, I applied gentle heat stirring the entire time and closely supervised by M. The mix heated up very quickly and soon thickened. It was ready when it became difficult to stir any more and resembled thick mashed potatoes. When it resembles thick mashed potatoes, the clay is cooked. I quickly turned the clay out into a mixing bowl and covered it for 10 minutes whilst allowing it to cool. 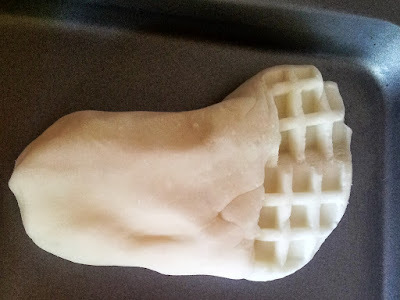 The clay needs to be kneaded as soon as it is cool enough to handle, at which point it will still be fairly hot, so this is a job that needs to be done by an adult. 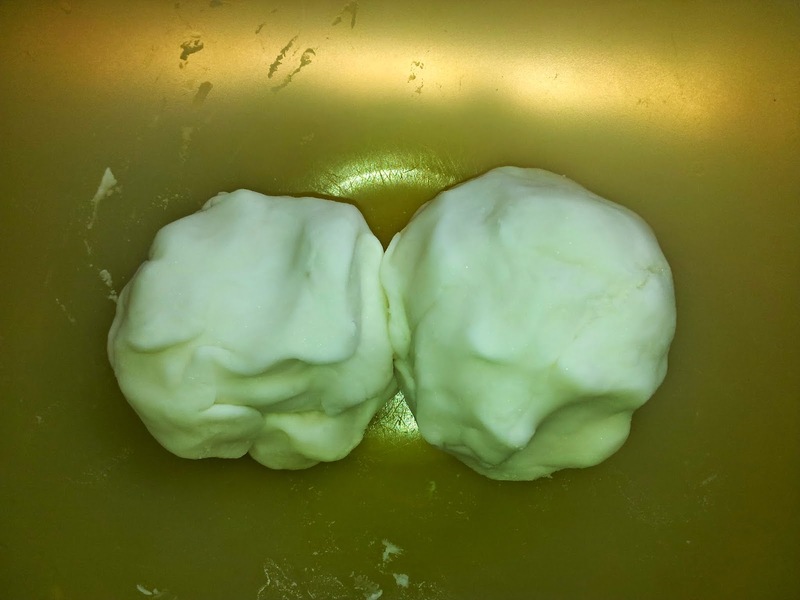 After about five minutes, the clay looked and felt like commercial playdough, although it has a distinctive smell. 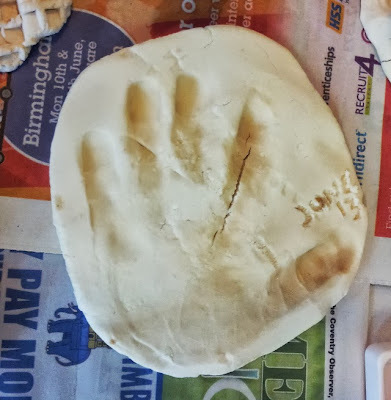 By this stage, the clay had cooled so it was just slightly warm to the touch making it safe for M to handle, which she did with great delight working for over an hour and a half on her creations. I took a small quantity of the clay and rolled it out a little before pressing it into a plastic bowl which acted as a mold. M decorated the bowl by stamping it until she was satisfied with the effect. M works on the key bowl. Stamping a pattern into the bowl. M is working on a chicken. 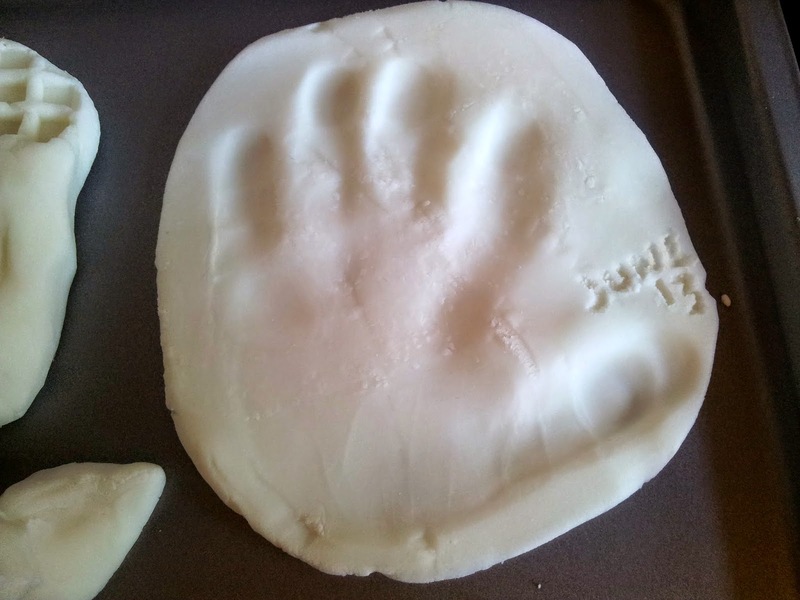 M's hand print before drying. An hour and a half later, we ran out of clay and M declared she was finished. 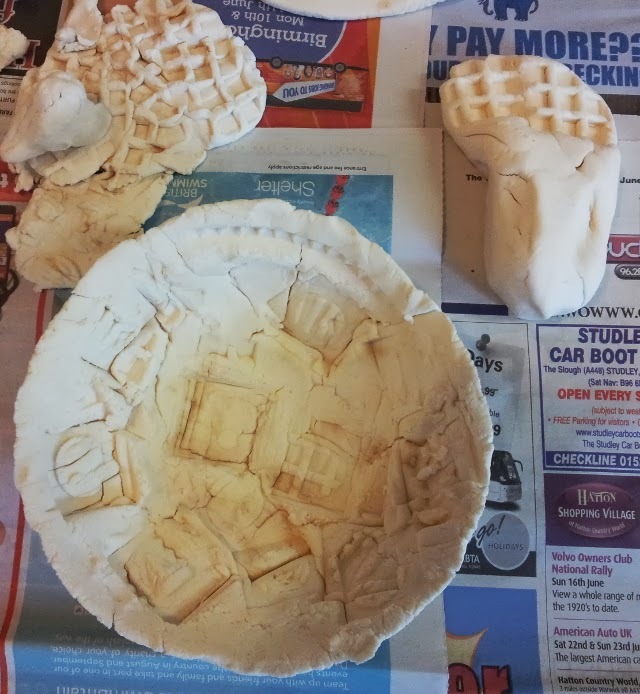 It should be possible to air dry this clay but the previous time we used it, I dried it in the oven. That time however we made Christmas tree decorations which were all thin, even layers or shapes produced by rolling the clay out and cutting with cookie cutters. This time, M's creations were various shapes, thicknesses and sizes, so I decided to give air drying a try. I put things to one side and waited... And waited... And waited... For a week... The day before Father's Day, the clay was dry to the touch, but still soft. Worse cracks were starting to appear, something we never saw with our efforts at Christmas. I decided enough was enough and dried the pieces the rest of the way in the oven. Dave helped - yes, I know, he wasn't supposed to know, but how do you keep creations these fantastic secret for that length of time? Drying in was done in batches, at the lowest oven setting (about 80C) over several hours, carefully rotating the pieces to ensure they dried fully. M's hand print including an impressive crack. Once they were dry, Dave give them a quick coating of spray lacquer whilst M was in bed so they'd be ready for painting, which M did the day after her birthday. 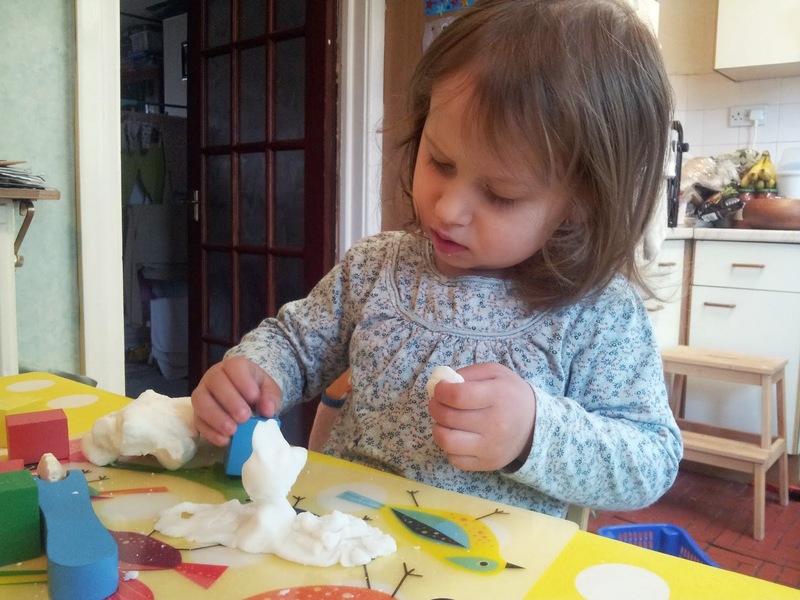 I can honestly say, M had as much fun painting her creations as she did making them in the first place. While I may have helped a little with the sculpting, adding colour was all down to M's discretion. As the artist's assistant, my job was to supply paint and glitter in suitable containers when asked to do so, clean brushes and carefully move the finished pieces to somewhere safe to dry. M paints Daddy's key bowl. 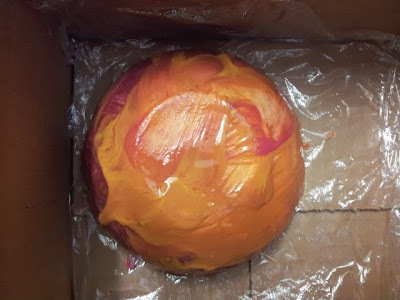 I stored the finished pieces in a box lined with cling film to prevent them sticking to the cardboard. The inverted bowl, set aside to dry. M is a 'more is more' kind of artist and likes to layer her paint. She also likes to drip paint, which is to say she puts a lot of paint at a high point and them watches it run and pool over whatever it is she is painting. This creates interesting marble effects. For M, mixing colour and seeing what happens is fascinating as is adding large quantities of glitter. 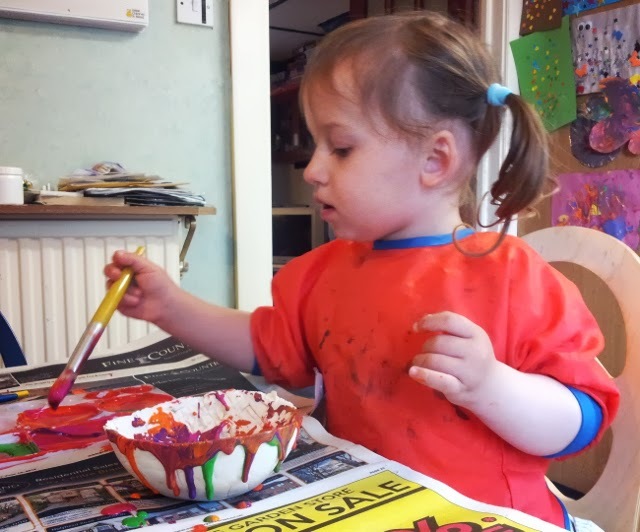 It is not unusual for M to repaint something several times, changing its colour each time until she gets the exact effect she was looking for. Hence, it took over two hours for M to diligently paint these with Dave in mind. It was a fun project that I know we'll have to repeat, possibly just making things for M's enjoyment next time. 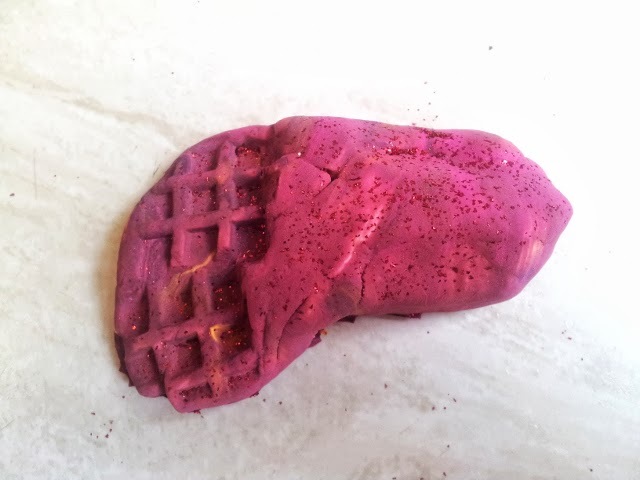 I'd like to experiment with drying methods, while air drying would be great, it took too long and I'm fairly sure was responsible for the cracking we saw. Force drying this clay off in the oven does cause minor discolouration, which is not a problem if you intend to paint your sculptures, but may be an issue if you want to preserve the natural white colour.